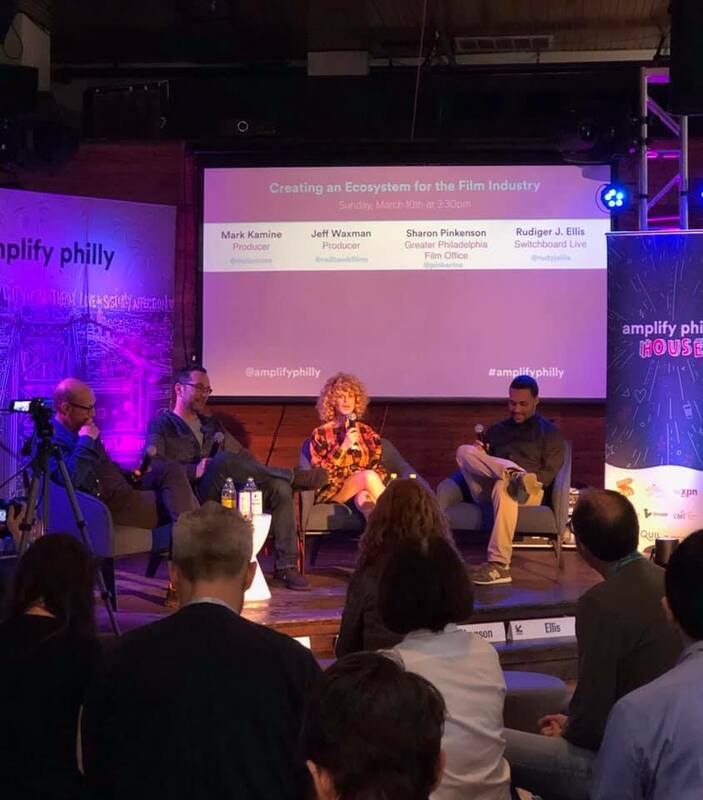 WATCH: The ‘Creating an Ecosystem for the Film Industry’ panel from Amplify PhiIly at SXSW Festival with our Executive Director, Sharon Pinkenson, Producer Mark Kamine (Silver Linings Playbook, Limitless, Law Abiding Citizen) and Producer Jeff Waxman (Vice, Mother!, John Wick 2 & 3). Panel date: Mar 10, 2019 at 3:30PM at Pour Choices in Austin, TX. Creating support systems for growing business sectors is not just limited to the tech startup community. In this panel, we will take a look at how Philadelphia is taking a shot at LA and NYC film and tv production industries.With the abundance of channels to stream new content – ie. Amazon, Netflix, Hulu, etc. – there is more opportunity and demand than ever before for cities to grow their film economies. What are the key ingredients for successful, burgeoning film industry in cities who are trying to break into this? And what are the economics which make it worthwhile to make the investments. Mark Kamine, Producer Mark Kamine has executive produced “Brad’s Status,” “Second Act,” the “Bad Moms” movies, and “God’s Pocket,” and co-produced “American Hustle,” “Silver Linings Playbook” and “Ted.” His other film and TV credits include “The Fighter,” “Limitless,” “Law Abiding Citizen” and “The Sopranos.” He has written reviews on fiction, film and other topics for the Times Literary Supplement, The Believer, The Wall Street Journal and The New York Times. Sharon Pinkenson, City Film Office Sharon Pinkenson has served as the Executive Director of the Greater Philadelphia Film Office (GPFO), for 27 years She has been responsible for all aspects of the office since 1992. Now, after more than $5 billion of economic impact to the southeastern Pennsylvania region, she has successfully elevated GPFO from the little-known permit office it once was to one of the most well-respected film commissions in the industry. In doing so, Sharon has cemented Philadelphia’s reputation as one of the best media production centers in the country. Always innovative, Sharon is constantly creating new programs and businesses to enhance the industry she deeply loves. Jeff Waxman, Producer Jeff Waxman, D.G.A., P.G.A. has produced over thirty feature films. Notable credits: Vice, Mother!, John Wick 2&3, Hot Pursuit, Out of the Furnace, Mirror, Mirror, Immortals, The Fighter, Law Abiding Citizen, Before the Devil Knows You’re Dead, and Narc. Prior to producing, Waxman worked as a production executive at several independent production companies. Waxman was born in Queens, NY and graduated from SUNY Oswego. He now lives in Long Island with his wife Lauren and their two children, Danielle and Jesse. Moderated by: Rudiger J. Ellis, Switchboard Live Rudiger J. Ellis, better known as Rudy, is the CEO of Switchboard Live; the developer of a B2B-SaaS based live video, social media management platform named Switchboard Cloud, that helps Creators, Producers, & Brands manage the distribution & syndication of their live video activations, across multiple streaming platforms to improve audience reach & engagement. In the past 10 years, Rudy has held various senior leadership positions within the network operations and live streaming services industries. He is also a Philly StartUp Leaders board member and was a mentor in the most recent cohort of the Comcast NBCUniversal LIFT Labs Accelerator, Powered by Techstars.